When did Halloween Become So Gruesome? 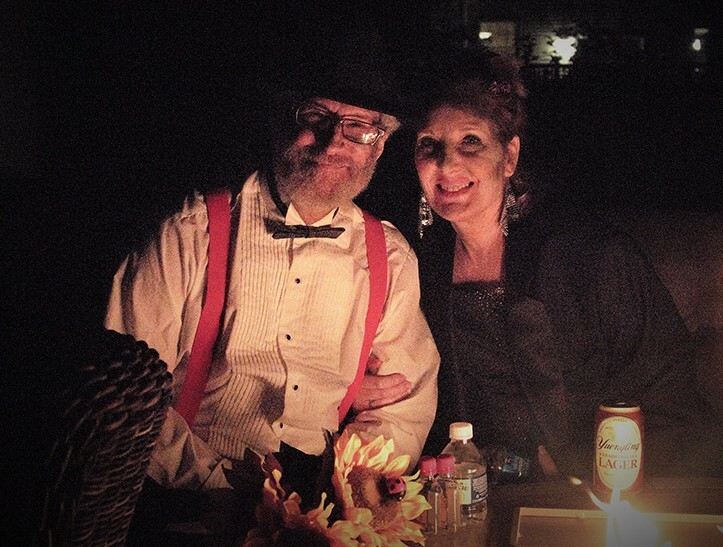 The Gruesome Twosome–Stan and I at the party at the Essential Lightworker’s house! Photo by Brent Samuelson. He and wife Kristen are founders of Three Little Birds Perinatal & Palliative Care Advocacy & Support Centers. Our makeup was done skillfully and beautifully by Jae Burton. I would hate to think as I advance in age that I am becoming a crochety old lady. But I have to say that Halloween used to be about Jack-o-Lanterns, ghosts that were kinda like Caspar, and more candy than you could possibly eat. My costumes of preference were always cute (like the year I was Dorothy from The Wizard of Oz) or beautiful (like the rose-selling girl I dressed as in Kindergarten). For that costume, my mom made a huge beautiful skirt of skillfully crimped red streamers, and made roses out of said streamers. It took her weeks, but when she was finished, it was magnificent. Of course, there were kids who dressed up as skeletons, half-dead soldiers and other gory things, but nothing was ever too scary. I will admit that our costumes this year bordered on the blech. Our daughter’s BFF made us up as rotting zombies. But we were tasteful zombies, all decked out in formal ware. So, we were more funny than frightful. In 2017, Halloween is all about the shock, and not as much about the fun. It’s been a long time coming—creeping toward us like a bloody spider made from red Jell-O. Case in point, my last blog post was about my obsession with “Cupcake Wars” on The Food Network and the Cooking Channel, where the grossest thing you’ll see during the year is the chefs using beef jerky in cupcakes. One of last night’s episodes of “Halloween Wars” featured a pumpkin sculpture of a slaughtered two-headed pig with vomit made from candy. Needless to say, I quickly changed to the Cooking Channel, but they were showing how to deep fry butter. All-in-all, a nauseating night for TV cooking shows. So I’ll persevere until November 1, when the Thanksgiving and Holiday cooking shows begin to pop up to comfort me. I’ll slide right back into my safe place of pretty cookies and layer cakes and dishes of butternut squash. PS: Am I really an old fuddy duddy when it comes to this gruesome and grotesque turn that Halloween has taken? You can give it to me straight. I can handle it. I’ve seen candy vomit and deep-fried butter. Tobi, I am with you. I have never been one for the gruesome costumes! Happy Halloween to you!! Thank you, Marie T! And Happy Halloween to you, too! LOL! I’ve never eaten one, either, Marie G! Happy Halloween! Thanks, Sue. I have always loved Halloween, from the time I was a child through now. I made my kids’ costumes every year, ran their parties at school, and enjoyed going to a friend’s party every year. The only thing I’m not crazy about is the super ghoulish spin that people tend to put on it these days. Looking forward to seeing you soon! Tobi…… I always thought I was the only one who despised October cooking shows. In fact it’s so bad that I will watch almost any other channel to keep from seeing the cooking channels. November 1 cannot come too soon!!! Thanks for making me feel somewhat normal! We love your daughter at Franks & Beans. You are normal. Take it from me. I’m normal, so I know. When those nice Holiday cooking shows come on, I’ll be thinking of you!